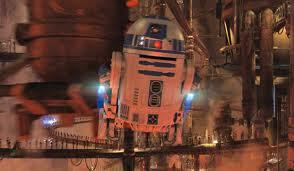 Out of all the Star Wars prequels, Attack of the Clones appears to get the easiest ride. The Phantom Menace is held up as the epitome of terrible filmmaking, while Revenge of the Sith is accepted (albeit grudgingly) for tying up the origin story of Darth Vader. Attack of the Clones is the one that no-one seems to moan about, leading us to believe that it is completely forgettable and therefore not worth getting mad about. Unfortunately, that becomes impossible when we realise how truly terrible it really is. It took a long time for me to decide whether Attack of the Clones is actually worse than The Phantom Menace or simply as bad but in a different way. Both are complete betrayals of the ethos and execution of the original trilogy, both of them are infantile to the point of madness, and both of them resemble a headache-inducing mix of video games and bad fan fiction. The answer lies in understanding exactly what kind of betrayals we are talking about, on top of its obvious flaws as a piece of filmmaking. 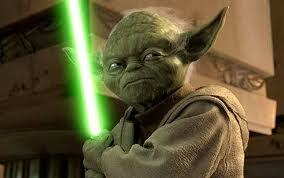 The Phantom Menace betrays the original trilogy because it deviates from them so markedly. Whether it's midichlorians, Jar Jar Binks, or a plot about taxation, the first film contains countless elements that have no place being in a Star Wars film. 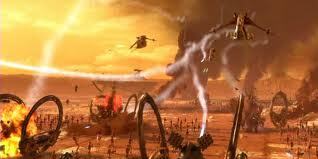 Attack of the Clones also contains huge betrayals, or at least moments which seem greatly out of character. But it also contains something more offensive: it borrows greatly from the original trilogy in a desperate attempt to demonstrate that all its departures are somehow in keeping with the story and imagery of the wider saga. 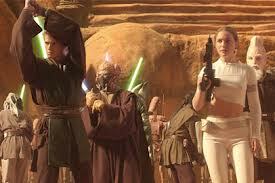 Whole sections of Attack of the Clones feature Lucas borrowing from the original trilogy. The Clone Army are essentially first-generation Storm Troopers, while the fleeting reveal of the Death Star and the numerous scenes on Tatooine make us cast our minds back to Episode IV. The bar scene is like the bar scene in A New Hope, the sequence of a ship clinging to an asteroid is straight from The Empire Strikes Back, and the set-piece in the arena is very close to Return to the Jedi (and Gladiator). You can't blame Lucas for wanting to give the fans something closer to the original trilogy, in order to mitigate the backlash from The Phantom Menace. But all these scenes do is leave us longing for the originals even more, or trembling in fear at the prospect of Lucas remaking them with modern technology (he's promised not to, but don't count on it). It's a catastrophic error of judgement by Lucas, since we are now more likely to feel betrayed by the bizarre tonal shifts, stupid visuals and terrible dialogue he foists upon us, with even the slightest deviation from the story or spirit of the originals being magnified in attention and annoyance. There are whole sections in Attack of the Clones which make you want to rip out your hair and scream at the blatant and cynical disregard for continuity. We always knew that C3PO's main role was prissy comic relief, but that's no excuse for such groan-inducing puns as "is my head on straight?" and "I'm beside myself". There is no explanation given for Yoda's ability to suddenly do back-flips, despite the fact that he spends most of both trilogies hobbling around with a stick. And then there's R2D2 having rockets which enable him to fly, which would have been useful on Dagobah but serve no purpose here other than create an excuse for another toy. 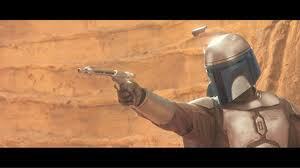 As if that wasn't enough, the film manages to botch the introduction of Boba Fett. Fett is considered one of the coolest characters in Star Wars, with fans even using his first appearance to justify The Star Wars Holiday Special (yes, such a thing exists, and it's worse than the prequels). But Lucas fails to realise that Fett's appeal is rooted in his mystery: we have no idea where he came from, we just know that he means business. 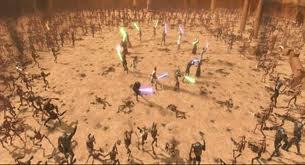 In Attack of the Clones, he does nothing of any significance and is given a cheap Batman-style origin with his father being killed by Mace Windu. As with Vader, the prequels take a threatening, enigmatic villain and turn him into a little boy who just needed closure. Perhaps that's how they bonded in The Empire Strikes Back? As with my review of The Phantom Menace, everything I've covered so far could be dismissed as the rantings of a disillusioned fanboy. But even without the obvious betrayals, or the stuff with Boba Fett, Attack of the Clones is a horrendous film in every aspect of its production. If the first film demonstrated that Lucas really couldn't direct, this is the film that demonstrates for all time that he definitely cannot write. Perhaps no film since Xanadu has had such a complete disregard for the cinematic rule of 'show, don't tell'. We are asked to accept so much because we are told it happened, rather than emotionally bonding with the characters in the way that makes it seems real. For example, we are told that Anakin and Obi-Wan are friends, but all they do is fight, bicker and moan about each other's arrogance. They seem so genuinely uncomfortable around each other, that it's no wonder Anakin turned went to the dark side to get away from him. The plot of Attack of the Clones is full of gaping holes, and like its predecessor there are too many of them to cover without turning this review into a list. In short, Lucas continues to throw pointless nonsense at us in order to pad out the prequels and put off the creation of Darth Vader for another two hours. His various plot points serve no narrative purpose, nor do they add weight to Anakin's universe: they only serve to confuse us more and make the Jedi look idiotic. For all their knowledge of the Force, they aren't in the least bit surprised that a clone army has existed in secret for the same amount of time that Sidious, sorry, Palpatine has been the Chancellor. 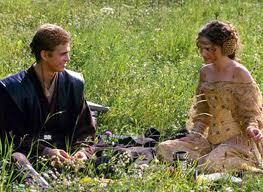 But no aspect of Attack of the Clones is more nonsensical, or painful, than the romance between Anakin and Padmé. Lucas' romantic dialogue is so corny and misjudged that it makes even the worst rom-coms look like Annie Hall. Anakin isn't the least bit charming or appealing: when he's not moaning or sulking, he's trying to woo Padmé with dialogue that would be more at home in a serial killer film. But rather than running a mile while she still can, Padmé goes along with it because the wider plot requires them to eventually have children. It's quite possibly the worst romance in the history of cinema, producing either despairing apathy or downright hatred for these characters. 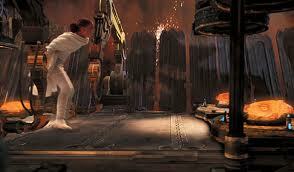 The acting in Attack of the Clones is every bit as bad as before. Ewan McGregor is trying hard, but the only difference between then and now is that he spends more time shouting at people. Hayden Christiansen is the definition of wooden, looking completely out of his depth and being unable to deliver any of his lines with any convincing emotion. Natalie Portman spends every scene looking like she desperately wants to escape, as if being imprisoned in the dungeon from V for Vendetta would be less of a torture than having to wear those outfits. Even Christopher Lee can't save it, making the very least of a boring character an unconvincing fight scene. On top of all this, the action scenes still look like a bad video game. Every one of these scenes finds Lucas cramming the screen so full of pointless stuff that we can't make out any of the details, or bond with any of the characters. The car chase at the beginning not only rips off Blade Runner and The Fifth Element, but it's so chaotic and poorly edited that we simply don't care who's chasing whom or why. 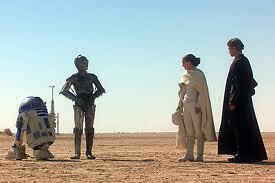 The fights are so incoherent and absent of tension that we start longing for Lucas' dialogue scenes. Even if people are just walking into rooms and explaining the plot, at least we can make out who's delivering the exposition. 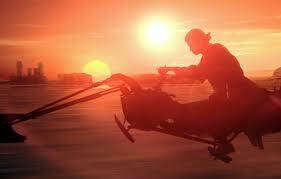 Star Wars: Episode II - Attack of the Clones is a mind-numbingly terrible follow-up to The Phantom Menace. As a piece of filmmaking in isolation, it's every bit as baffling, offensive and incompetent as its predecessor, but once you take the issues with series continuity into account, it ends up being marginally worse. It's a cynical, nonsensical piece of vomit-inducing garbage, and the product of a truly delusional mind. Our only consolation is that there is only one more prequel to endure, before we can finally get to the good stuff.